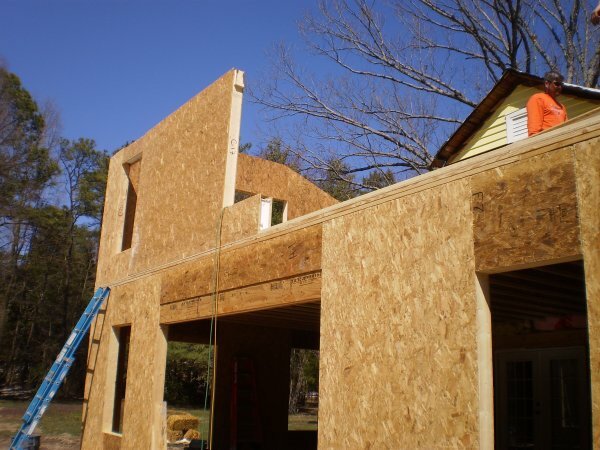 Here in the Richmond, Virginia area (RVA), I initially found it challenging to find the right team of architects and contractors to build a home addition using SIPs (structured insulated panels). I made a lot of phone calls, interviewed builders, and conducted a lot of research. It took some time to gain the knowledge needed by a Homeowner GC. But in the end I finally found there are more than enough resources available in Virginia to get the job done; and get it done right. I truly enjoy learning and I must admit, it has been a journey. I have been told all kinds of misleading “half-truths” and out right wrongs concerning the construction of energy saving buildings. First and foremost, educating yourself is key to managing a successful Homeowner GC project. But make no mistakes about it, understanding the basics is important to both hands on DIY folks and those hiring a General Contractor (GC). It didn’t take me long to realize not all GC’s are created equal when it comes to today’s energy efficient building methods and his or her knowledge of building science. And guess what? I also found several self-promoted “green” builders and architects are NOT as well informed on energy efficiency or experienced with quoting a SIP project as they claim to be. In addition, I found several lacked an understanding of ROI – your return on investment – when it comes to the myriad of potential energy efficiency solutions. In this post, I am going to share some of the knowledge I’ve gained about SIPs, energy efficiency, and project management. I hope the info is helpful to you. Don’t be inhibited by what some folks (if not a lot of folks) will tell you about SIP buildings. You’ll likely hear they cost too much; I heard they cost too much over and over. However, done right they are well worth your consideration and they don’t necessarily increase your total cost of construction. Actually, I have come to the conclusion they are less expensive to build and subsequently maintain than traditional stick-framed homes and remodels. In addition, there are plenty of scientific studies, university research reports, and experienced professionals that confirm my conclusion. But again, you might not hear that from your architect, designer, and/or many local builders. Given my environmental, science, and business background, my interest and focus is “smart” energy conversation. Don’t be fooled; some “green” contractors and architects will gladly waste your greenbacks. One popular, local green builder told me it would take more than twice the average cost per square foot to build a “green” addition, “his way.” After interviewing the chap, I could only conclude he was overly focused on incredibly expensive (and utterly wasteful IMHO) nuances of green building. He was proud to say his crew would even control, at your expense, practically every particle of dust that could enter your home during construction. Hiring a maid to clean the house might be a little more practical as well as more cost-effective. He also suggested I consider tearing the existing structure down; this is one of the more wasteful environmental practices on the planet. His credibility nose-dived on the spot after that comment. I had him out of my house in less than 15-minutes. Sad thing is, his company is building and wasting a lot of homeowners’ money so he can win green awards and get print in magazines. Seriously, it is not hard to educate yourself concerning the basics. There’s more to exterior walls than meets the eye. It is important to note that the R-value of a whole wall can be considerably lower than the R-value of the insulation. Whole wall R-value calculation procedures factor in all of the effects of additional structural members at windows, doors, and exterior wall corners. My search began as usual on the Internet. I found several local “green” architects and designers and subsequently contacted them. Unfortunately, putting the right “team” together was more challenging than expected. We were also referred to a local but small architectural firm with SIP experience which we hired. The architectural firm was involved with a SIP home being built in our area. To make a long story short, we fired the architectural firm (that’s another story) and we were disappointed with the “experienced SIP builder they recommended. The guy “talked the talk” but just didn’t “walk the walk. We called the builder and requested a quote for a project at one of our rental properties; they did a brief site visit then never quoted the job or called us back after telling me he would twice. When I mentioned his company to other folks in the industry, they said they had similar experiences with the guy; never called them back or came up with references that were requested. Again, the architectural firm we fired “highly recommended” this particular builder; again, do your homework and definitely get multiple references. No doubt, spray foams offer better insulating value than fiberglass. However, the studs in a stick-built structure need to be considered. Studs actually lower the insulating performance of the wall and may allow water vapor, as well as air, to enter the house. Air infiltration is considered the greatest contributor to energy loss. By the time a stick-built house is properly sealed with spray insulation, the “total cost” of the wall generally exceeds the cost of installing SIPS. Of course, you want to add up all of the materials used and the additional labor required to stick-build. And, don’t forget to add in the additional cost of waste disposal for stick-built walls; there is far less waste created during construction with SIPS. The use of “rain screen management techniques” for wall assemblies is recommended and often required by code in certain jurisdictions. Design requirements for wall cladding systems must consider local environmental conditions and assembly restrictions as defined in applicable building codes. Check with your SIP manufacturer’s installation guide for general reference information; there are also several SIP Installation guides available online (one example: SIP manufacturer, Insulspan SIP Installation Guide). Caution! Many builders are not keeping up with the trends in energy efficiency and building technology. Case in point. We obtained quotes from builders that included a new HVAC system for the first floor of our home. The builder’s HVAC sub-contractor visited our house but neglected to collect the critical data necessary to properly size the HVAC. Although he claimed he would base his recommendation on a Manual J calculation (HVAC load calculation), it appears he did what many HVAC subs do. He likely based his recommendation on his decades of experience on NOT on our specific situation. Many local codes require Manual J and Manual S calculations for new homes and remodels. The fact is, few contractors take the time to collect the necessary data to properly perform the calculations. The methods used to insulate a home are changing rapidly; air infiltration is the culprit. Significantly reduce air infiltration and you’ll need a smaller HVAC system (costs less to buy and saves energy). The typical HVAC contractor often selects an air conditioning system for a home based on the old rule of thumb, “500 sq. ft. per ton.” Wrong! The sub-contractor in this case over-sized the HVAC by a ton – literally (12,000 unnecessary BTUs). We had the HVAC load calculations performed based on our specific situation and we know for sure his recommendation was way off. Over-sizing of HVAC systems is a really bad idea – they don’t run efficiently, they cost you more to buy, and they wear out faster. Conditioned attic and crawl space verses unconditioned (proper attic insulating methods makes a big difference in your energy use – if you want to save money in the long-term, make sure your attic is properly insulated). Don’t leave panels exposed to the elements for long periods of time. Don’t lift SIPs by top OSB facing or drop SIPs on corners. Don’t install SIPs directly on concrete. Don’t cut wall panel skins horizontally for installation of electrical wiring or overcut the OSB facings for field-cut openings. Use factory provided chases in SIP core. Don’t be afraid to field trim panels for an exact fit. Don’t install recessed lighting inside the panels. Don’t put plumbing in R-Control® SIPs Panels. Don’t install or use unvented combustion equipment such as vent-free gas logs, fireplaces or heaters in an airtight SIP house. “SIPs perform at about 97% of their stated R-value overall, losing only 3% to nail holes, seams and splines. Because of the variety of thermal breaks in conventional wall construction, the whole wall performance is 30% less than the stated R-value of the wall. Stud walls lose thermal performance to studs, nails, screws, wiring, switch boxes, and other breaks in the thermal barrier. “[T]the whole-wall R-value of a 2 x 6 wood frame wall with R-19 fiberglass batts installed with rounded shoulders, 2% cavity voids, and the paper faces fastened to the inside surface of each stud was only R-11. 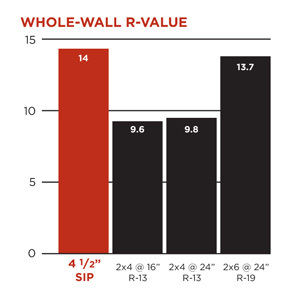 This whole-wall R-value represents a 42% reduction from the R-19 value printed on the fiberglass batt’s label. The seemingly insignificant insulation installation errors and thermal shorts resulting from interface details accumulate to significant impacts”. (“Calculating Whole Wall R-Values on the Net” from Home Energy Magazine Online, November-December 1999).